Traveller's Rest Equine Elders Sanctuary: Today I am Angry. 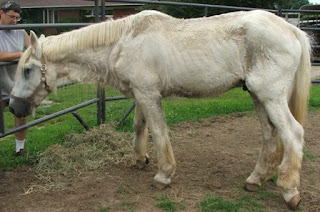 Having spent 15 years in the horse rescue field, I long ago learned to not get angry about the condition of new arrivals. Getting angry does not change the past and it certainly does not help a horse heal. Today, however, I am angry. Maybe that is because Forrest's case is still so raw. Maybe because Nathan, the new gelding, has more serious problems than one horse should have to deal with. Perhaps its because an owner once again waited until it was likely too late to help before asking. Probably also because the calls to rescues all over Virginia are coming on a more frequent basis with no slowdown in sight. For today, though, we need to focus on Nathan. We know he is very underweight. He appears to have Cushings. He shows signs of advanced neurological impairment. His feet have been neglected, at least one filled with maggots. The vet, bless her, is again on her way on a weekend. We'll have a more thorough evaluation later today. Unless she can offer a miracle, however, we are likely facing a hospice situation. To deal with that, we will have to set the anger aside and let Nathan know that someone gives a damn. Inhale........Exhale...........Inhale..........Exhale.............wax on,.........wax off. This is what we're here for. Doesn't mean its always easy.